Introduction: The client is an Insurance company in the USA wanting to automate their infrastructure and have a robust framework on cloud. Challenges: Client was facing issues regarding managing their infrastructure on-premises and desired an automated solution for their cloud infrastructure. 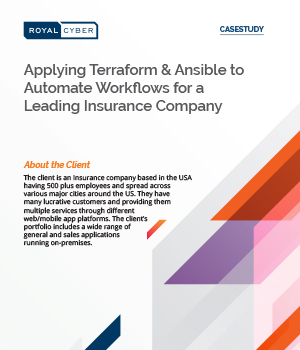 Solution: Royal Cyber team automated the client infrastructure on cloud and categorized infrastructure code for better business development as well as high availability.